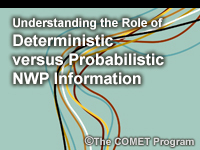 Understanding the Role of Deterministic versus Probabilistic NWP Information is part of the "NWP Training Series: Effective Use of NWP in the Forecast Process." This lesson first covers deterministic (single) NWP model forecasts and explains advantages and limitations through a case example. Then it discusses overcoming the limitations in deterministic forecasts through the use of ensemble forecast systems, and the use of deterministic and probabilistic forecasts together, through case examples. I didn't like all the true and false questions on the quiz. It is a good lesson if you are new to ENS forecasting. However, if you already have experience with using EPSs you will find this lesson not challenging. August 2016: HTML framework updated to latest cross-browser compatibility standards.